Decade stands for the ten years OSV has been productive, delivering an instrumental album every year. So basically it also means the tenth album of the US based fusion and instrumental rock trio. Should I refer to trio here? A bit of a doubt, because the liner notes always refer to both founders; drummer Gary Oppert and bass man Steve Sexton, who saw co-founder, keyboard player Brandon Vaughn first replaced by Sergey Boykov and later by Mathieu Fiset. On the other hand virtuoso guitarist Marcel Coenen has been a steady factor, playing the majority of tracks since the second OSV album. Whatever you would like to call OSV, I guess the music itself is much more important that categorising the band. 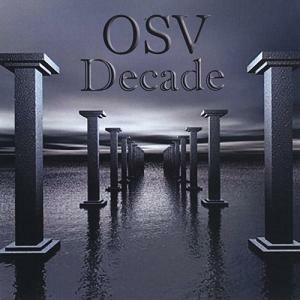 From the first album OSV has been producing high quality instrumental music, where sometimes the fusion aspects are highlighted, other times the fine progressive melodies and intense keyboards parts are in the lead. But every new album will surprise you with the presence of impressive guest guitarists. On Decade the afore mentioned Marcel Coenen and the Singapore guitarist Dhalif Ali share the bulk of guitar duties, while Norwegian Norge Olsen adds his jazzy fusion parts to the short opener Star Gate and duels with Coenen in Rapture. The latter is a very strong composition, highlighting both drums and the fine bass parts as well as Fiset's keyboards, Planet X comes to mind, especially when both guitarists enter. Fast, melodic solo's, Tony MacAlpine style make this a very interesting track, the more the continuing bass line underneath is so impressively blended into the song. Dhalif Ali stars as only guitarist in some of the more melodic, jazzy tunes of the album, like the title track Decade, Ever Present, Avenue 35 and the final track Shalom. As a first time musician for OSV, he really impresses with his mature playing over the always adventurous background of Steve's bass and Gary's solid drums. Where previous albums saw an equally divided guitar vs keyboards element; Decade turns out to be a true guitars album. On Quasar, both base guitar players are accompanied by a third guitarist. The addition of the young Argentinian Mathias Villagra is a great addition to this sinister dark progressive metal track. Lee Luland returns after his contribution to OSV's previous album; Time Zone (2016, see review) an album I unintentionally mentioned as their eight release. Lee as well as Marcel lay down some strong solo parts over again a solid base of Steve and Gary. The subtle piano parts perfectly fuse the shed elements with a more jazzy touch. Magic Elf's Carl Roa is a musician I highly regard, during the powerful Bogota, he adds his distinguished fusion driven parts, together with Coenen and Juan Simon Ramirez, a young Colombian musician. Another returning guitarist is Jonas Tamas, who plays in an incredible nice bluesy style. Perhaps because of the relaxed atmosphere of the song, including slower, emotional soloing, Carlos could be my personal favourite for the Decade album. With Geocentric, the pace is cranked up again, although the piano adds it's delicate note, the focus here are the power riffs of Coenen and yet another guest; Spanish Borja Mintegiaga Galende. I guess the contrast between two shredders and the afore mentioned piano is a huge one, but remains interesting'till the end. Lone Star is like True Anomaly a Marcel Coenen only composition. Here he adds his nice overtones, arpeggios and other impressive elements to some of the fines tracks on the album. With Decade, OSV has produced an album with emphasis on guitar, more than the keyboard parts. Giving several young international musicians the chance to play on one of their albums is a very nice gesture of the band and I guess the mentioned guitarists will certainly be noticed. Decade is a very strong instrumental album; strong compositions and solid craftsmanship. Recommended to shredders as well as fusionatics and fans of strong instrumental compositions.